Warm circumpolar water passes through the Drake Passage and flows eastward in the Antarctic Circumpolar Current (red arrow). Some of the flow is diverted southward into the Weddell Gyre and becomes more dense, sinks, and flows out near the bottom (blue arrow). 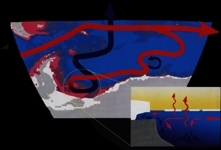 The inset illustrates the two processes that increase the density: lowering the temperature by giving up heat to the atmosphere, and raising the salinity of the remaining sea water by forming nearly salt-free ice in the very cold environment. Predicting near-term global climate changes depends on how well the many processes that make up Earth's climate system are understood, how realistically these can be expressed in global change models, and how effectively the evolution of the system can be extracted with powerful supercomputers. One of the most important processes-one that is uniquely related to the Antarctic-is ocean ventilation, the process by which the deep ocean affects the atmosphere on the time scale of decades to centuries. If we could mark a cubic meter of sea water and follow its global meanderings through the various oceanic current systems, we would find that it spends most of its time isolated in the deep ocean, where it is dark and cold. Only occasionally-once every 600 years on the average-would it appear on the surface, and then only in high southern latitudes. In the tropics and sub-tropics, a thin surface layer of warm (hence lighter) water prevents deep water from coming to the surface. South of the Antarctic Circumpolar Current, this warm layer disappears and no longer inhibits the upward movement of water. This process is called overturning or ventilation of the ocean. Typically, when deep water reaches the surface, it gives up heat to the much colder atmosphere and picks up dissolved atmospheric gases, including carbon dioxide. The ventilation or overturning of the ocean can affect climate change in two important ways. The delivery of heat to the atmosphere raises the temperature at high southern latitudes, and the removal of carbon dioxide into the deep ocean for long-term storage reduces the greenhouse effect. The removal of carbon dioxide is crucial for global change. We have learned much about how carbon dioxide and water vapor-two greenhouse gases-act as an insulating blanket in the atmosphere and that the surface temperature will increase as the atmospheric level of carbon dioxide increases. For nearly 40 years the rise of carbon-dioxide levels in response to fossil fuel and biomass burning, as well as fluctuations due to natural effects, has been observed. However, to express effectively how the atmosphere reacts to the production of greenhouse gases in a global climate model, we have to understand how the atmosphere can shut off the overturning of the southern ocean. We can think of at least two ways: one is to create less dense water at the surface through warming or increased precipitation at high latitudes; the other is to slow down the Antarctic Circumpolar Current. The study of these processes is a continuing high priority in Antarctic oceanography.